The PF-9 is a semi-automatic locked breech pistol chambered for the 9mm Luger cartridge. 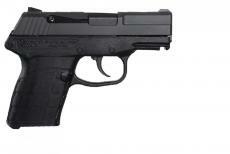 It has been developed from the highly successful P-11 and P-3AT pistols with maximum concealability in mind. The PF-9 has a single stack magazine holding 7 rounds. It is the lightest and flattest 9mm ever made. Firing mechanism is double action only with an automatic hammer block safety.